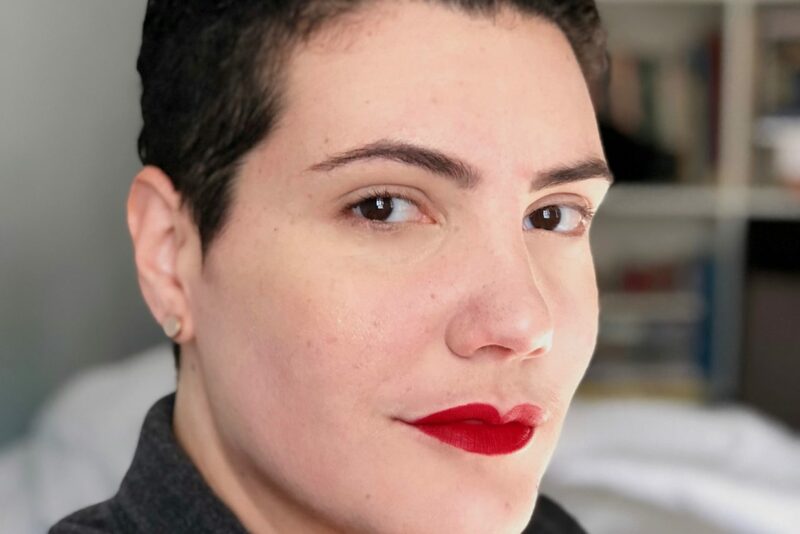 The Free Library of Philadelphia selected 32-year-old Raquel Salas Rivera, an established poet and author, as the 2018-2019 Poet Laureate. For those who may be unfamiliar, the Poet Laureate is a civic position, that recognizes an extraordinary poet who has an established commitment to the power of poetry. The Poet Laureate is tasked with involving and inspiring people throughout Philadelphia’s neighborhoods via poetry. Rivera is a Puerto Rican and identifies as non-binary. Rivera’s style of writing can best be described as like water: refreshing, adaptable, constant and free flowing, yet powerful like a large wave or strong current. I was fortunate to speak to the new Poet Laureate and ask Rivera about the position, poetry, writing, belonging, what it means to be non-binary and more. My email (laughs). I have about five emails that I use for different projects, I usually don’t get into books until after I’ve had my coffee. My mother normally sends us coffee from Puerto Rico, but lately we’ve also found a place where you can order the coffee online. What is your process for composing your work? Do you write in Spanish first? I almost always write in Spanish first, but there are occasions where it is important for me to write in English. For example, I’m currently working on a manuscript titled, “while they sleep (under the bed is another country).” The body of the manuscript is in English, and the footnotes are in Spanish, this is very intentional. My first book, “Caneca de anhelos turbios,” was published by the Puerto Rican press Editora Educación Emergente in 2011. It is a 126 page book in Spanish, which took me about six years to complete. I never thought I’d write another book like it, but three books and three chapbooks later, here I am. Two out of four of my books have been published with translations into English. I published one chapbook in English, but the rest are in Spanish with translations. Language is affective, it’s entangled with one’s history, relationship to literature, exposure to different discourses, and experiences. Jack Spicer one said the aliens sent him his poems. He believed that even if poems came from the subconscious, the subconscious can be as far away as Mars. I’d like to add that it can be as close to home as oneself. Our most intimate experiences of estrangement take place when we are most vulnerable and open. Have you ever been so in love that you feel shocked and betrayed when the person you loved didn’t understand something about you, no matter how small? This is kind of what it’s like to reread my poems. I know I’ve written them. I know they are some of the deepest parts of my being, but I also side-eye them. They’re often rude and it feels like they were both gifted to and stolen from me. What attracted you to poetry? Any early influences? My grandfather, Sotero Rivera Avilés, is a Puerto Rican poet. Poetry was always around. My mother used to read me these children’s stories written by José Martí (who everyone should read), “La edad de oro,” and she would also play Juan Luis Guerra when we were cleaning the house. Most people don’t know that [the song] “Frío Frío” is a musical interpretation of a poem by Federico García Lorca. My mother is also a poet, she used to write poems for me and read them to me. Yet, the first time I thought of myself as a poet was after I read Langston Hughes. I spent a few years reading and rereading his Collected Works. I was living in Houston, had no friends, and used literature as a way to make sense of the world. Hughes brings in different traditions, he knows when to be lyrical and when to be blunt; he served as a model. What do you do to turn off poet-mode or are you always in poet-mode? I don’t think I realized how I am always on poet-mode, until I met my partner Allison, who is always busting on me because I can’t turn poetry off. Sometimes though, I like watching films and tv shows and that is engrossing enough that I forget about poetry (sort of). Your poetry shows your pride as a Puerto Rican; why is it important to you to include your culture in your work? Well, I am Puerto Rican. I’m not sure if I’m included it as much as I am writing because of what matters to me. I write about my life, my experience. After the hurricanes, a lot of Puerto Ricans question their sense of belonging, (as a Puerto Rican myself, I think about it too) What’s your take on this? There is a lot of bridge-building that needs to get done. We all come from different types of pain. Some of us carry the pain of having left Puerto Rico, some of having stayed, and others of never having visited, these are different, but connected experiences. A lot has been written about the differences, but less about how to breach those and create healing spaces. It’s going to take more than each of us speaking our truth. It’s going to take a lot of listening to each other and translation. About 10-15 years ago it was important to be “labeled” as something. Goth, Jocks, Nerds, etc., there was a clique mentality. Now 2018 it’s the reverse, people are free to define themselves and to be undefined too. As someone who identifies as non-binary; why do you think that is? Well, I think there is a common perception that being non-binary means you defy definition. I explained being non-binary to a friend in the following way: if you are describing the ocean would you describe it as “not the forest” or “not the mountain” and leave it at that? That would be a poor description, since an infinitude of things can fit those categories. My being non-binary is very material, very defined, just not within the binary. For example, my gender is a lot like the gender of Boricua trap artist, Bad Bunny, but not like my partner’s gender, which is also non-binary, but far from femme. Sometimes I describe my gender as “buchipluma,” which in the Puerto Rican dialect of Spanish means flaky, but also can be read as a neologism that combines “bucha” and “pluma” and the feminine “a” with the gender neutral “i” ending. In other words, I’m a feathered butch. There definitely aren’t any feathered butch conventions, but there are ways of celebrating that identity on a daily basis with my queer fam. Do you feel that social media has any impact on poetry? How it’s shared, perceived, relevance? I have many friends that hate social media. Maybe it’s because I’m a millennial, but I love it. Tweets are an alternative to haikus. Selfies are a completely new genre. It’s cool if it’s not your thing, some people don’t like sonnets, but to reject these forms as irrelevant is to be a luddite. How has your poetry evolved since you have started and up until now? My poetry changes every time I begin a new project. There is usually a period where I’m absorbing new works, thinking about how to push my work to the edges of myself, and then the writing begins. My first book was dense, baroque, and loaded with my new-found enthusiasm for writing. This last book is sparse, the verses are short and isolated like broken beads. Can you walk us through the process to becoming the Poet Laureate of Philly? How long did the selection process go on for? When did you find out? I applied. I heard back about a month and a half later. During that month, I tried and failed to stay calm. Then Andrew Nurkin (Deputy Director of Enrichment and Civic Engagement at the Free Library) called me with the news and I couldn’t believe it. The hardest part was keeping it a secret until early January. I’m terrible at keeping secrets, especially good ones! What’s the next step in your role? I am currently organizing a festival for Summer 2018 that foregrounds poets of color who live and write in Philadelphia, but that brings POC poets from all over to the city. I am co-organizing it with Kirwyn Sutherland, Ashley Davis and Raena Shirali. We are so excited about this and can’t wait to announce the lineup and locations. My plan is to organize readings in spaces, where there wouldn’t usually be a reading, in collaboration with community organizers. Philly is a sanctuary city not just in name. It’s a ciudad santuario because there are spaces to welcome and support people who come from all over the world, who come to make new homes and build communities. I want to bring together different poetry spaces and languages in new and interesting ways. I have already been doing this work, but the poet laureateship would make it much easier logistically, as well as exponentially more visible. I will host a series of readings in different parts of the city, that will bring different communities and languages into rooms and outdoor spaces they wouldn’t otherwise inhabit. I also plan on making these more of events than straightforward readings by combining poetry with other art forms and acknowledging that none of these exist in a vacuum. Everything. It means I have the opportunity to keep doing what I’ve always done, but with more support. Lastly, could you recommend some local poets to our readers?